Posted by sneaks in great ideas, J is for Juvenile. 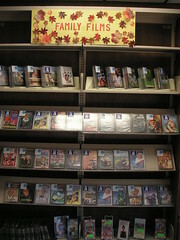 CHICAGO – The Association for Library Service to Children (ALSC), a division of the American Library Association (ALA), has awarded children’s librarian Lisa M. Shaia with the 2008 ALSC/Tandem Library Books Literature Program Grant for her program “Superhero Club” at the Bristol Public Library. 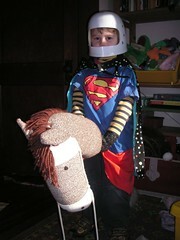 Shaia’s program, Superhero Club, encouraged children to use their imagination by creating a superhero alter-ego, complete with a costume, accessories, superpowers and a sidekick. Each club member then drew a comic book starring his superhero and at the end of the session, used their superhero powers to compete against supervillains in an obstacle course. The program, which ran for five weeks in the spring and then eight weeks in the summer, introduced club members to the superhero genre and encouraged them to read from the library’s growing graphic novel collection. It is Shaia’s hope that introducing young readers to pleasure reading, such as comic books and graphic novels, will keep them interested in reading through their ‘tween and teen years and into adulthood. Posted by sneaks in great ideas. Do you host or facilitate a book club or book discussion group? Do you belong to one? Book Group Buzz is a new blog full of reviews and resources for book groups. Launched by Booklist Online, the blog features categories such as Reading Guides, Good Books for Book Clubs, Books for Youth, Adult Books, etc. In addition there are lists of Best Author Websites and Best Reading Guides. One way to respond to this news, and to draw attention to it, might be to print one or two of these graphs and post them alongside a display of family reading – books that appeal to broad age ranges that a family can read together. Or, since the report finds that the amount of time a child spends reading is directly proportional to the number of books in the house, post news of the report that directs your customers to your Sale Books. The PDF of this 98-page report is available here. A PDF of the Executive Summary, 20 pages and loaded with graphics, is here. And the graphs are available here. They are easy-access: downloadable, printable, and not PDF files. The graph at the head of this post is from this page. 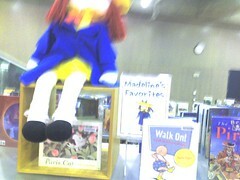 Posted by sneaks in display topics, E, great ideas, J fiction, J is for Juvenile, J non-fiction, Picture Books. 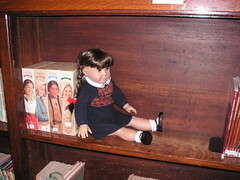 Librarians in the children’s section select books that they think would be favored by well-known characters from children’s literature, and display them along with an oversized representation of the character and a little sign. Babar might promote Alexander McCall Smith‘s Akimbo series; Miss Spider would read books on etiquette; and Curious George would read practically anything – he’s a curious little monkey, after all! Posted by sneaks in great ideas, problem solving. 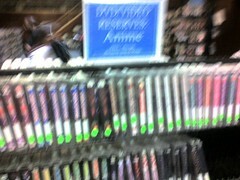 Apologies for the super blurry photo… while we were in Seattle, we noticed this removable spine label for New books. It has a space for noting the month and year that the book came in, which must make weeding the new books shelves SOOO much easier! Also easier to I.D. new books in the return room. 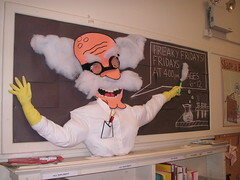 Posted by sneaks in BCPL best practices, display topics, great ideas, recommended by. How do you decide what to read? We may follow certain authors, take clues from book covers, or even read reviews… but personal recommendation is still one of the strongest factors in selecting a book. Outside the library, people get recommendations from friends and colleagues, and from Amazon’s extensive web of cross-references, like the “Other people who bought this book also bought…” feature. 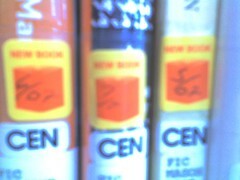 Inside the library, we get to recommend books face-to-face. 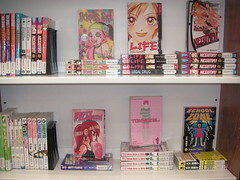 If you maintain a Staff Recommends display, with the staff member’s name attached to each book, you are in effect creating brands specific to your library. Ruth Brown in Pikesville is a brand – there are people who will read books she recommends, no questions asked. This is priceless added value, something that most bookstores cannot match, and it’s in our best interest to promote this service with staff and the public alike. Melissa Gotsch started this up here. It’s very simple: everyone on the staff–volunteers, teen CAs, part-time, full-time– EAGERLY writes their name on the Staff Recommends bookmarks and sticks them in a handful of their choices. We have devoted a full section of shelving at the end of our New Fiction area to these staff selections (in ALL formats). It has become so popular with customers and staff alike (and so congested with recommendations) that in July we also devoted our portable round unit on wheels to an auxilliary display at the entrance of the branch. I’ve been astounded at the turnover of these materials! When the “Picks” are checked out, the bookmarks are (aggressively) collected and tallied at the end of each month on a spreadsheet at one of the computers at our combined desk. The full list of staff members and their monthly totals are posted in the office. Just last month, I started rewarding the top three “producers” with cheezy cheap prizes. Many branches do a variation of this, but I’ve never been in a place where the staff enthusiasm was so great that it is an constant feature in the branch, and the materials on view was so varied. Many staff members have developed their own groupies; “Sam” is always #1– one of our customers was shocked to hear that Sam was the woman who had just helped her at the Information Desk…. What do you do to show off this service? 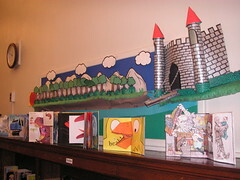 Posted by sneaks in great ideas, J is for Juvenile, Picture Books. 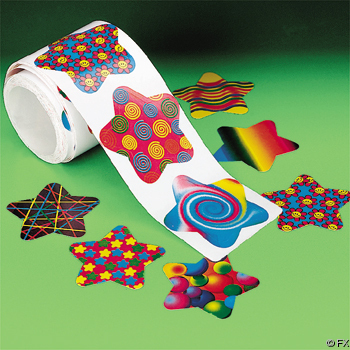 In an attempt to increase circulation after storytimes, we are offering handstamps as incentives to children who check out material. The Program team checked stats and saw a slight increase over the previous month. They are recommending that we try it again during June. Stats will be compared to June 06 to see if circ increased. When a storytimer hands a book to a child at the end of storytime, it has enormous cachet. There’s a lot to do when setting up for storytime, but assembling a stack of books that relate the the theme of the storytime almost guarantees that those books are going to be checked out. Information Today offers a system for evaluating your library’s physical environment. Called “How to Evaluate Your Library’s Physical Environment” (uh, yes), it’s worth carrying on a thought-provoking stroll through the branch. 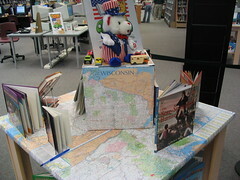 Residents of Moline, Illinois answered that question and were photographed with their book for a special exhibition celebrating the opening of the new Moline Public Library. Check out the pictures – they’re just lovely. And with the advent of easy digital photography, why not try something like this at your branch? 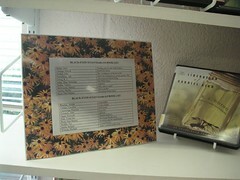 Posted by sneaks in BCPL best practices, display topics, great ideas, spring. This year, cultural institutions such as libraries, archives and museums are using May Day, May 1, to promote emergency preparedness. Much attention has been paid to the devastation suffered by museums and libraries in the wake of Hurricanes Katrina and Rita, and the damage and theft that occurred during and immediately after U.S. forces entered Baghdad. 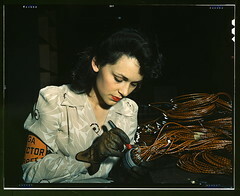 The Heritage Emergency National Task Force urges cultural institutions across the country to observe MayDay by taking at least one step to prepare to respond to a disaster. Posted by sneaks in BCPL best practices, great ideas, programming tie-ins. Do you bookmark upcoming programs? 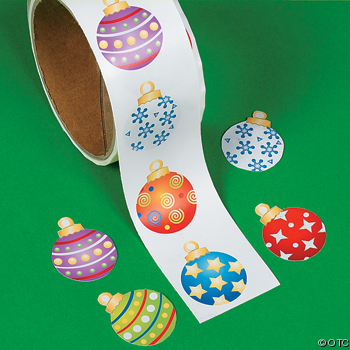 Here’s a great idea we’ve seen at a number of branches – we wondered if everyone was in on it. When you promote a program in advance with a display of on-topic books, slip a flyer (fold it in half lengthways if necessary) into each book. That way, every interested customer walks away with a reminder of an event they’ll surely be interested in. Towson recently pulled a batch of Star Wars books and displayed them with flyers for their upcoming author program (Star Wars from the Inside Out, with best-selling author James Luceno, April 1) folded into each. Posted by sneaks in great ideas, science fiction. We added a green glow to our science fiction shelving lights by using flourescent light sleeves from an aquarium store. It certainly sets the section apart. Karen adds that Arbutus began seeing better circulation of their science ficiton collection when they beefed up complete sets of popular science fiction series. 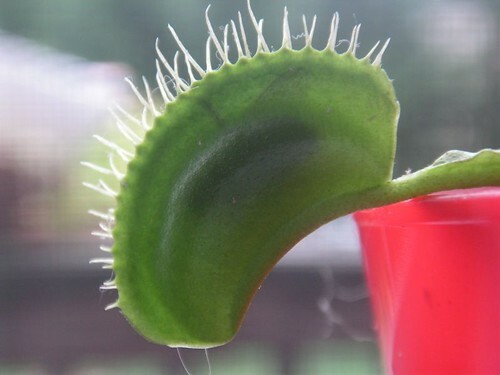 PS: If anyone has any pictures of this out-of-this-world phenomenon, please send them to pwilley-at-bcpl.net. Thanks! Posted by sneaks in great ideas, J fiction, J is for Juvenile. … if you’re a J author in Towson, that is. You might see some little balloon tags around the JArea. 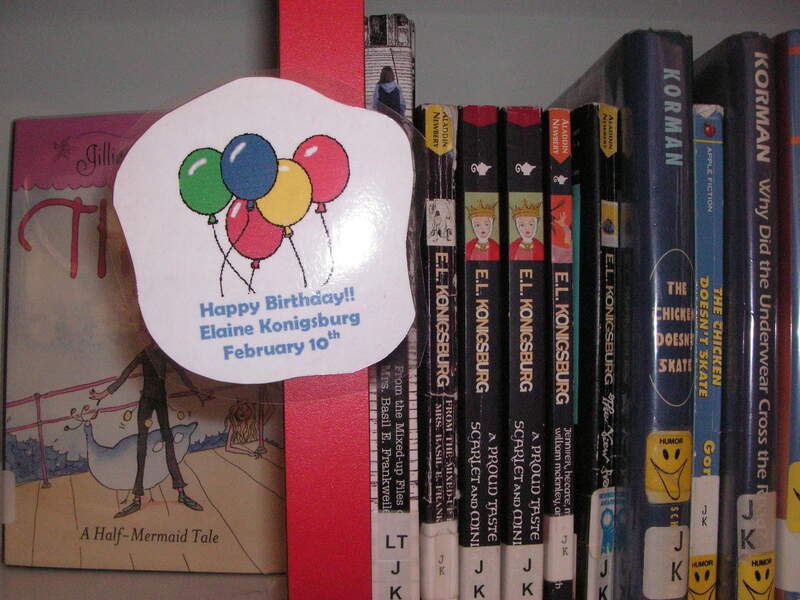 I’ve stuck up very small “Happy Birthday” signs next to childrens authors (Easies and J Fiction) who have birthdays this month (with the author and date). 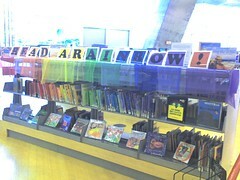 It seemed like a fun and simple way to put a little more color around and maybe highlight some good authors. If the signs don’t all get destroyed in the first week, I’ll probably try to keep it up each month. Feel free to give a bit of a merchandising preference to anyone you see with a tag. After all, it is their birthday. 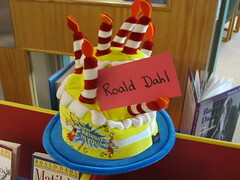 He uses the list of authors and their birthdays compiled by Kidsreads.com. 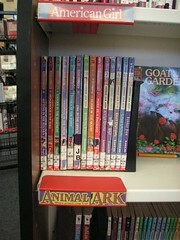 Kidsreads.com is a nice place to visit if you’d like to keep abreast of upcoming books, especially series titles. They have links to tons of author websites, games, and reviews as well. This painted book truck was spotted on a recent tour of Enoch Pratt. This is a wooden cart, but a metal one would probably work just as well. Painted in bright primary colors, Pratt uses it as a portable display unit. 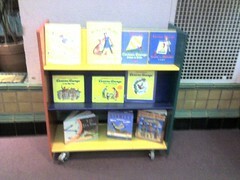 For storytimes, they load it with themed picture books and wheel it into their storytime area. At other times, it nestles against any free unit end or slice of wall space. Posted by sneaks in display topics, great ideas, J is for Juvenile, spring, summer. 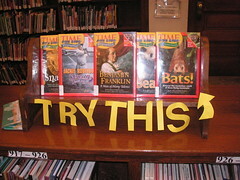 Here’s a great idea for always being able to put your hands on your lists of Juvenile award-winning books. Perry Hall prints the lists on bordered paper and sets them out in an easel stand – easy for you to find and easy to point out to a parent if you’re busy. Posted by sneaks in display topics, great ideas, J is for Juvenile, tables. 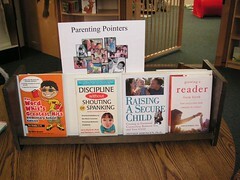 This tabletop display of parenting books sits on a table just outside the baby area in Towson. 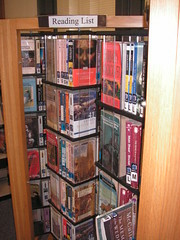 It is stocked not only with books, but with flyers and other pickup items as available. This great idea comes from Mercedes Mendoza in Towson. Thanks!